Dishwasher, washing machine, hair dryer, telephone, high speed internet access, television, pool (15m x 8m). Heating extra. Tourist tax to be paid locally. *April 13-27 & Dec. 21-Jan.4. Another view of the living room with the dining room behind. The dining room with living room in the background. Master bedroom with 4 poster bed. One of the bathrooms with jacuzzi tub. The property has beautiful views. Lounge on the patio during your stay. Views from the lawn and garden. This very special property is located on the edge of Castello di San Donato in Perano (Chianti), a beautiful hamlet which has recently been restored to such a high standard that it was awarded by the International Property Awards 2006. Cavalcanti’s position allows the guests to enjoy unusual privacy compared to other units on the Estate yet take full advantage of the shared gardens and swimming pool. Castello di San Donato in Perano is set in one of the most spectacular positions of Tuscany, in the heart of the Chianti region between the historical villages of Radda and Gaiole in Chianti. The hamlet boasts a central position among the 360 hectares of vineyards belonging to the Estate and is composed of a castle dating back to the 10th century and a church along with several other buildings. 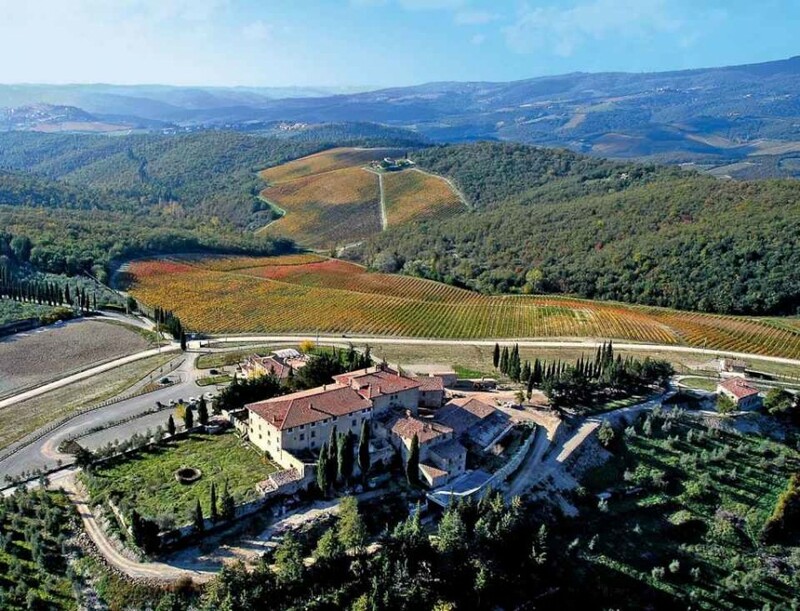 The discerning owners, who previously owned another farmhouse of very high standard in Chianti, recently made the decision to purchase Cavalcanti for its extraordinary beauty. They have furnished the interiors at the highest possible standard and equipped it with all modern facilities. A particular feature of Cavalcanti is the beautiful terrace and garden where guests can appreciate the most stunning views of the surrounding countryside when simply relaxing outdoors or having al fresco meals under the well furnished pergola. On the ground floor guests will find a large sitting room and kitchen both opening onto the front terrace. There are 2 master bedrooms with four poster beds, en-suite bathrooms (both with Jacuzzi baths and separate showers). One master bedroom has a walk-in wardrobe. There is also a twin bedroom with en-suite bathroom (bath and separate shower). All bedrooms open onto garden/terrace. Maid service is included 2/3 hours a day, 4 days a week. Part-time gardener also included. 6km to Gaiole in Chianti PO, bank, 28km to Siena, 40km to San Gimignano, 60km to Florence.